Seattle and Tacoma have a thriving theater scene with an impressive lineup of places to see a show. Whether you prefer a huge venue that draws major headliners and touring shows, or something smaller, local and more intimate, you'll have no trouble finding either events, shows or theaters. While some theaters are dedicated to musicals, such as the 5th Avenue, others like ACT Theatre lean toward plays. Given the eclectic nature of the Pacific Northwest arts, many playhouses have very unique shows combined with the familiar standards. If live theater or shows isn't your thing, Seattle also has a list of awesome movie theaters, including some that serve alcohol. The 5th Avenue is a prime spot for many of the best musicals in the region, including some pre-Broadway test runs. This theater is decked out with Chinese-inspired décor, with Chinese brackets arching over the heavy front doors, bold colors inside, and a huge giant dragon coiled around the chandelier on the ceiling. 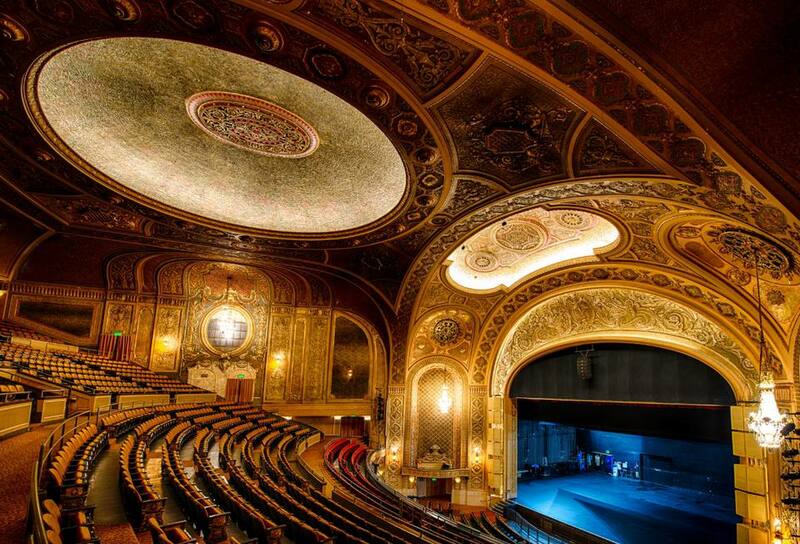 The Paramount Seattle is among Seattle’s oldest theaters and has more than 2,800 seats. In short, it is a great place to find headliners, comedians, touring musicals, and plays. Because of its size, if you're in the the back of the mezzanine, you'll feel pretty far from stage, but the theater is so beautiful inside you might not mind too much. The ACT Theatre is one of Seattle’s largest playhouses. This venue focuses on contemporary plays and has since 1965, and puts on many world premieres. The plays here showcase local and national talent. Another of Seattle’s largest playhouses, the Intiman Theatre has put on plays for over 40 years. A repertory company of actors complements a team of talented artists who run, manage, and provide educational opportunities at the theater. The Neptune Theatre started its existence as a movie house in 1921, and continued in this capacity until January 2011, but today is a multi-use arts venue. Concerts, comedians, speakers, films, and more are on tap there today. Seattle Repertory Theatre is one of the biggest regional theaters anywhere in the U.S. The theater puts on classics and Broadway shows and has had famous actors such as Laurence Fishburne and Samuel L. Jackson perform here. Part of the Seattle Theatre Group, along with the Paramount and Neptune, the Moore Theatre hosts shows that are alternative in one way or another—Seattle Rock Orchestra, Black Nativity, music acts, and all perform here regularly. With two locations, the Village Theatre is one of the best places in the Seattle area to catch a musical. This theater puts on some of the best-known musicals, but also offers one comedic or dramatic play each season. The Blue Mouse Theatre is one of Tacoma’s most historic movie houses and theatres. For the most part, this venue is a movie house, but on occasion, local plays or performances are also on stage here (especially during festivals). This small regional theater is located in the Lakewood Towne Center. Its exterior may not attract much attention, but the plays and musicals here are acted by local, dedicated actors and are often well-known titles. Tacoma’s most historic theater, the Pantages is one of many Pantages theaters across the U.S., all built during the Vaudeville era by Alexander Pantages. Today, the theater attracts plays, speakers, comedians, and more. If you're looking for touring headliners or shows in Tacoma, this is the best place to look. Adjacent to the Pantages in downtown Tacoma, the Rialto is about the same age as the Pantages, but a bit smaller inside. The decor is ornate and the events are largely touring musical performances. Symphony Tacoma, quartets, Classical music, and local holiday shows are all regulars here. While this community theater is small, it is quite well established. It has been around since 1918. There are six shows each season, including creepy plays during the Halloween season and a Christmas play in December. It's also right across from the Parkway Tavern, if you seek a drink before a show. This is the largest community theater in the Northwest and puts on exclusively musicals, often well-known ones too. The shows are high caliber and the talent the theater brings in is equally so, often trading actors with the 5th Avenue in Seattle. This venue is the most modern of the venues under the Broadway Center for the Performing Arts. The array of shows at the Theatre on the Square is vast, and includes classic films, quirky performances, and many local performances.